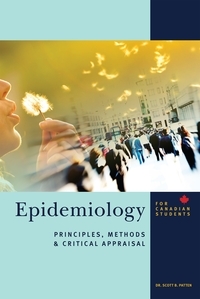 The second edition of Epidemiology for Canadian Students introduces students to the principles and methods of epidemiology and critical appraisal, all grounded within a Canadian context. This context is crucial—epidemiologic research in Canada most often uses data from Canadian registries, Canadian special purpose cohorts, provincial health administrators, national statistical agencies and other sources that will be important to Canadian students during their careers. Dr. Scott Patten draws on more than 20 years’ experience teaching epidemiology to present core concepts in a conversational tone and a pragmatic sequence. This second edition includes updated content and examples, double the number of study questions and answers, and new figures. - Basic principles and why epidemiological reasoning matters for health professionals. - Key parameters in descriptive and analytical epidemiology. - Sources of error in epidemiology, and ways to quantify and control error. - The concept of bias, which is introduced with basic parameter estimates to make it more accessible to students. - Key study designs and their vulnerability to error. - How to use critical appraisal and causal judgement to evaluate epidemiological studies. Dr. Scott Patten obtained an MD from the University of Alberta in 1986, and subsequently completed an FRCPC in psychiatry (1991) and a PhD in epidemiology (1994) at the University of Calgary. He is a professor in the department of Community Health Sciences at the University of Calgary and is a senior health scholar with Alberta Innovates, Health Solutions. He has over 20 years experience teaching epidemiology and supervising graduate students. As a researcher, he has published more than 400 scientific papers and is the editor-in-chief of the Canadian Journal of Psychiatry.